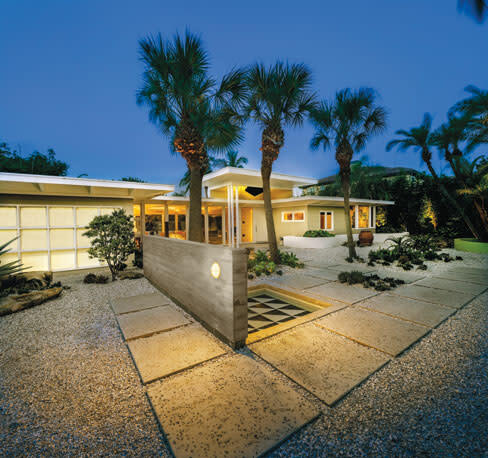 A Lido Key home emphasizes the defining principles of the Sarasota School architectural style. It's only fitting that Dan Denton lives in a home designed in the Sarasota School architectural style. Denton is the founder of Sarasota Magazine and a longtime champion of the city's cultural riches, especially its architecture. He and the Sarasota School seem perfectly aligned—low-key, idealistic and shaped by the Gulf Coast's unique environment and mid-century modern ethos. "This house was built in 1952—the same year I was born," says Denton. "I grew up in Florida homes and have always loved their shady overhangs, terrazzo floors and breezy lanais." But for Denton, nostalgia was just part of the story. Equally important was honoring a bit of the unique architectural legacy created by the group of young, progressive architects who achieved international prominence for their innovative work here in the 1950s and '60s. Originally designed for the late Sarasota gallery owner Foster Harmon and his wife, Martha, the single-story, wooden Lido Key residence has been a work in progress since Denton purchased it in 1989. "At that time rising property values were turning many fine Sarasota homes into teardowns," he explains. "I didn't want that to happen here, and I wanted to keep the connection to Sarasota history." 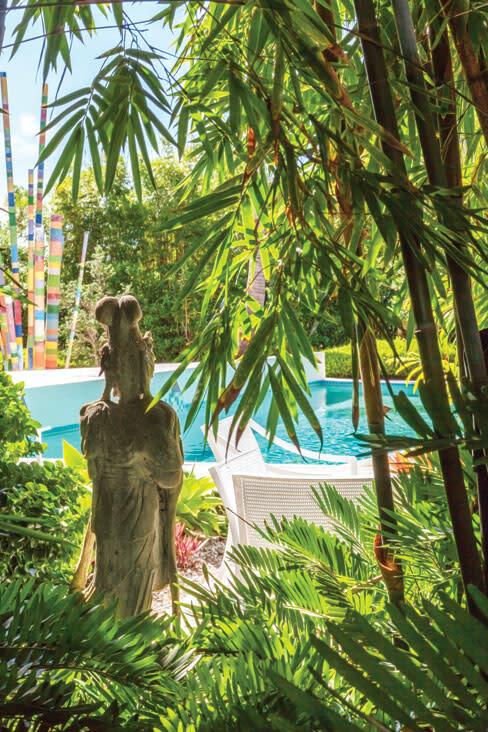 He shares the home with Ramses Serrano, who also owned a Sarasota art gallery from 1999 to 2005 and now divides his time between Sarasota and New York City. "The home was built at the same time as [architect] Paul Rudolph's Umbrella House, although the architect, George Barr of Winter Haven, wasn't famous," says Denton. He was attracted by the home's clean lines and "zippy" geometric design, he says, and wanted for the most part to retain the original floor plan. "The house has good vibes and a stimulating flow of spaces," he says. The small footprint and utilitarian layouts of the Sarasota School adapted the best of international mid-century modern style to Florida's climate and terrain, integrating interior and exterior spaces and blending into their sites rather than dominating them. Floating overhangs kept out the sun, and expanses of windows and glass sliders maximized cross-ventilation. The renovation occurred in two stages. 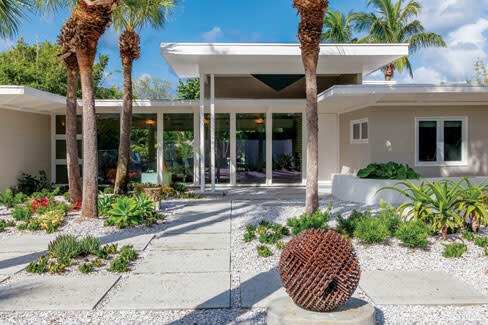 The first, with the addition of a swimming pool, garage and entrance canopy, was completed in 1990 under the direction of Denton's longtime friend, the late Sarasota designer Robert Beardsworth, of Beardsworth/Neal, Inc. Ten years later Denton asked Beardsworth's partner, Robert Neal, to consult on stage two with project architect Michael Epstein of Seibert Architects, a firm founded by Tim Seibert, a leader in the Sarasota School who actually begin his career as a draftsman for Paul Rudolph. "The second renovation took 12 years to design and complete, mainly because I was busy in Naples," says Denton. (He had expanded his company by purchasing Naples' Gulfshore Life, and moved there to manage the magazine, which he sold in 2012.) Such a long gestation period might seem like torture to some, but Denton says he didn't mind a bit. "We developed several complete designs with expanded footprints, including a two-story version," he says. "Ultimately we decided the house was large enough." The final pared-down design expanded the living area slightly with the addition of a guest bathroom, but updated the home and dramatically opened it to the surrounding gardens. The pool deck was broken into a series of interlocking paved and planted shapes to complement the geometric, oversized stepping stones previously designed for the back yard by Richard Anderson of The R. Anderson Co. The home's hub is a combination living/dining room with a wall of glass sliders opening to a screened lanai with views of the swimming pool and lush shoreline beyond, and in the front a courtyard and fountain beyond a new wall of glass. A precursor to today's great room, the living/dining setup was typical of Sarasota School homes, as are the home's master and guest bedrooms, each small by present standards and based on passive design principles of the day: Small, efficient bedrooms conserved energy and encouraged quality family time in cooler, cross-ventilated living spaces. The living space is furnished with a mélange of mid-century finds and design icons of the period. An Eames sofa lives in perfect harmony with Woman's Exchange cube chairs updated with hip kuba cloth-patterned fabric. A Warren Platner c. 1966 side table and a coffee table by T. H. Robsjohn-Gibbings contrast with a contemporary rope weave jute rug and classic green terrazzo floors of the Sarasota School era. Reflecting the period's space-age mania, a starburst wall sculpture hangs above a white brick fireplace wall that conjures images of TV sitcoms of the 1950s. A fireside reading nook features a curving wooden screen and a refreshingly avant-garde 1964 Djinn chaise longue and bench (named after a supernatural genie of the Koran) by Olivier Mourgue. Despite its vintage modern pedigree, the room comes off as contemporary and more timeless than time capsule. 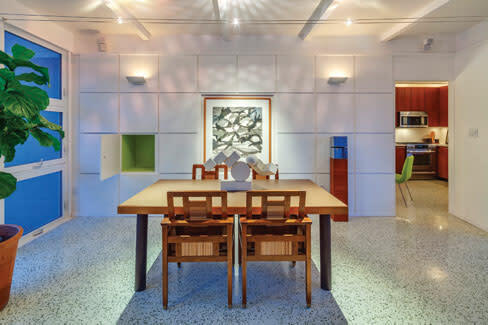 A custom dining table and teak dining chairs echo the clean geometry of the room's wall of wooden squares, and an abstract watercolor by Sarasota artist Maggie Davis occupies the recessed niche at its center. In the TV room and bedrooms are works by Sarasota artists and modern and contemporary masters. Office shelves brim with glass and ceramics collected over the years. "I went overboard buying vintage collectibles some years ago," Denton admits. "I've cut way back." Still, the kitchen drawers and cabinets seem to hold more pottery and glass objects than groceries and cooking equipment. "I'm not a cook, and the Circle has great restaurants just a block away," he says with a smile. "At least we're not storing things in the oven—yet." Sculptures and architectural fragments greet visitors throughout the property. A bronze tree trunk in the front courtyard was sculpted by the late Bill Tarr, whose The Spirit of Sarasota stands 17 feet tall outside the county administration building downtown. The outdoor collection also includes two geometric works by the late Tampa sculptor Richard Beckman and a backyard sculpture by Naples-based James Renfro that marked Sarasota Magazine's headquarters on South Osprey Avenue during the 1990s. True to Sarasota School principles, Richard Anderson's plant selections throughout the oversized lot tend toward the sustainable and drought-tolerant (read grass-free). Giant sea grapes obscure the home from the street, and bamboo screens views of taller houses on both sides. The rear of the canal-front house is completely hidden behind mangroves and sea grape. "The final effect of the remodel was to make the house more contemporary, yet even more a Sarasota School design than it had been," says Denton. "Bob Neal got to complete a project that his partner had started 22 years before, and for all us the process was a lot of fun—especially as mid-century modern design came back into vogue in recent years and sparked new ideas to give the house a fresh start." Frank Howell, Howell Construction Group, Inc.